Fantasia Scorpion 48″ ceiling fan with light kit in polished chrome with maple blades features a dual mount design and hanging pull chains that operate the three forward and reverse fan speeds and the three-light kit independently. This Scorpion combi fan has a polished chrome motor housing and maple finish blades. The motor is almost silent when operated on the lower settings and consumes 45w of electricity at the highest speed setting to give an impressive airflow of 4400 cu/ft per minute. This fan is dual mount and can be fitted flush to the ceiling as shown or with the supplied 6″ drop rod. Longer drop rods are available up to 72″ in length and it can also be upgraded to full remote control; please contact us for any of the options. 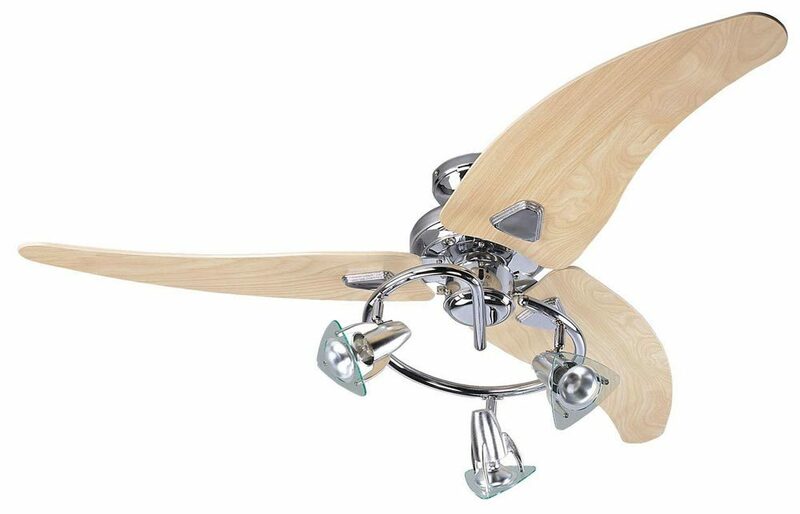 This Fantasia Scorpion 48″ ceiling fan with light kit in polished chrome with maple blades is virtually silent and supplied with a manufacturers 5-year motor guarantee. 1. How many speeds please? 2. Is there a reverse? 3. If I don’t purchase a remote control is it then operated by cords or chains and if so do you do extended lengths? (I don’t really want a remote as it’s something else to get lost). 4. I’m after 3 fan lights all identical, one to go on a flat ceiling and two to go on a sloping ceiling (about 19 degrees). Would this model work with the slope? This fan has three speeds forwards, and three speeds in reverse. The fan is controlled by pull cord chains, one for the fan, one for the light. We do supply extension chains if you wish to make them longer here: https://www.universal-lighting.co.uk/products/fantasia-ceiling-fan-pull-chain-extension-100cm/The fan can olso be controlled by a wired in wall controller, giving you on/off and three speed control from a wall switch. Available here: https://www.universal-lighting.co.uk/products/fantasia-satin-stainless-steel-rotary-fan-speed-controller-switch/This fan is dual mount, so can be fitted flush to the ceiling, or with the supplied drop rod for sloping ceilings. Please ensure that the fan is at least 7.5feet (229cm) from the floor for optimum performance and safety.